Any type of vehicle has room for a few improvements by way of the right accessory. With our vast inventory of Yamaha side by side accessories at the ready, get a few new additions for your model with ease and affordability. While this manufacturer offers high-quality craftsmanship with every model they produce, it doesn't mean you can't add a little extra to the design with the right accessory. We offer one of the largest selections of Yamaha side by side accessories to help you make the most of your vehicle. 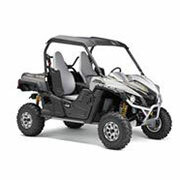 Since Yamaha is one of the top names on the market for this type of vehicle, it is no surprise they offer several different models. We are pleased to bring you options for all their top models with a range of years, so you can add the right accessory for your vehicle. Whether shopping for the Rhino 600 or the Viking EPS, we have you covered with all the options you could possibly need to fit the specifications of your model. In addition to offering a wide range of models and years, we also offer Yamaha side by side accessories to cover every possible aspect of your favorite vehicle. Whether on the hunt for front speaker pods, bi-fold ramps, sun tops, or a bow case mount, we have it all with this large selection of Yamaha side by side accessories. With options that are meant for fun and function, you are sure to find the right product with ease. Best of all, we offer only high-quality solutions made with the best materials and standards to ensure a long lasting and high performing addition to your UTV. From mirrors to mats, find it all right here with our extensive collection! Here at Yamaha Parts Nation, we are your destination for quality solutions at affordable prices. We are dedicated to delivering not only great products but also outstanding customer service. If you have any questions, please contact us for further assistance on the matter today.